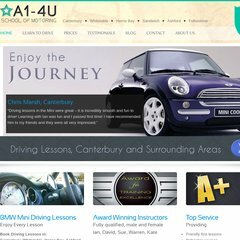 a1-4u.info A1-4U School Of Motoring, Kent Driving School. Learn to Drive in .. The site has about 12 users daily, viewing on average 1.40 pages each. Eukhost Ltd (England, Leeds) is the location of the Apache server. A1-4u.info's server IP number is 213.175.209.30. ns71.eukdns.com, and ns70.eukdns.com are its DNS Nameservers.